Mary Stanton, a grantee, alumni and board member of the Fulbright Association, was there as the organization's highest honor was awarded outside of the U.S. for the first time ever. Angela Merkel (in blue in middle) holds the Fulbright Prize for International Understanding. Edina resident Mary Stanton stands next to Merkel in black. Earlier this year, Merkel received the Fulbright Prize for International Understanding at a ceremony in Berlin. Stanton, as chair of Fulbright’s Alumni Travel Task Force, was invited to attend the ceremony. She and her daughter Katie, a graduate of Edina High School, sat with hundreds of others as the prize was awarded, for the first time in its history, outside of the United States. The Fulbright Prize for International Understanding has been given out since 1993 “to recognize outstanding contributions toward bringing peoples, cultures, or nations to greater understanding of others,” according to the website. Merkel joins a list of recipients that includes Nelson Mandela, Jimmy Carter and Bill and Melinda Gates. The ceremony began with a brief presentation on the history of the award, including mention of those esteemed recipients. “I think that seeing that history of it and seeing who else received the prize helped Merkel understand and see the importance of it, the significance of it, and also her place in history and in the world in terms of really outstanding leaders,” Stanton says. After speeches by CNN anchor Christiane Amanpour, Executive Director of the German-American Fulbright Commission Oliver Schmidt and German Fulbright alumnus Manuel Pauser, Merkel herself spoke, and Stanton says the chancellor clearly appreciated the gravity and gravitas of the award. Merkel’s speech touched on topics like the need for compromise, the historical relationship between Germany and the United States and the need to actively fight against the rising tide of nationalism across the world. Mostly, though, Stanton says, Merkel talked about people. When Merkel’s speech ended, it was time for pictures. “I was fortunate enough, when it was time for our pictures to be taken, to be standing next to her,” Stanton says. “Oh, wow. She turns around and says hello and I just thanked her. I mean, it wasn’t a big long conversation, I just said, ‘Thank you for everything you’ve done,’ and she said, ‘Well, thank you.’ Very down to earth. And appreciated it. 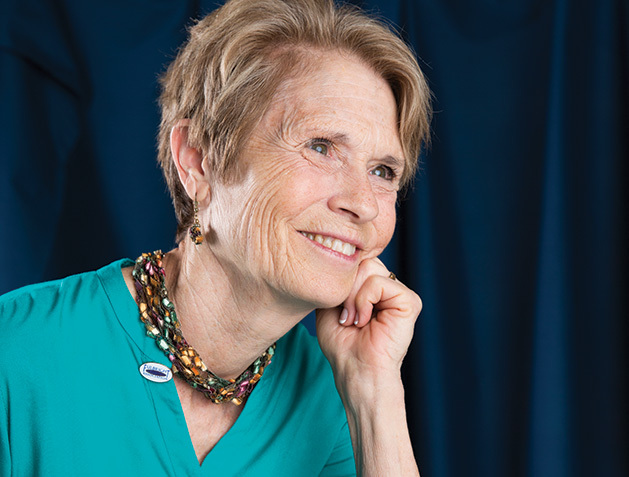 Stanton’s involvement with the Fulbright Association, whose mission is "promoting scholarship, collaborative engagement, and cultural diplomacy throughout the global community," began when she was a teacher at Richfield High School and applied for an exchange program. She was matched with a teacher in India and lived and taught in the country for six months. “An incredible experience, a very growing experience. Love the people. Had challenges adjusting to a different way of life and navigating my way around and so on and so forth,” she says. Stanton has also traveled to Vietnam, Albania, Serbia and Guatemala as a Fulbright representative, and she says those trips have taught her as much about the U.S. as the countries themselves. “We’re really quite fortunate in the United States,” she says. “I really learned how we have social mobility and we have a lot of freedom and we have a lot of accountability. You can learn more about the Fulbright Association and its many travel programs and opportunities on their website.